Dr. Harshana Rambukwella is an academic with an interest in literary history, postcolonial theory and sociolinguistics. Bringing these disciplines together, he recently authored the book ‘The Politics and Poetics of Authenticity’ (UCL Press, 2018), which examines the unfolding of Sinhala nationalism through the life and work of Anagarika Dharmapala, S.W.R.D. Bandaranaike and Gunadasa Amarasekara. 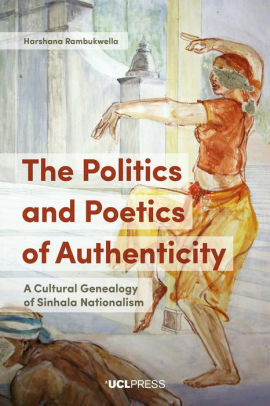 The book, which is now available in major bookstores, has been hailed for the “marshalling of sources available in the Sinhala language that are usually ignored in scholarly work on contemporary Sri Lanka,” (Prof. Jayadeva Uyangoda), and as a work that “guides the reader with compassion through the cultural and political whirlwind of colonial and postcolonial Sri Lanka,” (Prof. NiraWickramasinghe). Let’s begin with the book title. Why is it called ‘The politics and poetics of authenticity’? I also try to demonstrate how such notions of what is authentic and inauthentic have become part of nationalist politics. Because of this political dimension these are not just questions about individual taste or cultural preference, but questions with serious political implications. For instance, why do most of our politicians wear the white ‘national dress’ though this is not something that existed before the 1920s? Reviewing your book, Prof. Sumathy Sivamohan wrote: “Authenticity is about belonging and simultaneously serves to unbelong others, those who are inauthentic.” Do you agree? In discussing Sinhala nationalism, you stress on the notion of ‘apekama’ or ‘ourness’, and describe it as a type of cultural exceptionality that gained traction in post-independent Sri Lanka. Can you elaborate on this? Your book focuses on the era from late 19th century to the new millennium. Why, in your view, is this period significant to the Sinhala identity? You examine the lives of three iconic Sinhala nationalist leaders, AnagarikaDharmapala, S. W. R. D. Bandaranaike and Gunadasa Amarasekara. What drew you to these three personalities in particular? You refer to a ‘duality’ in Anagarika Dharmapala’s Buddhist activism, where he adopted a more universal approach abroad, and a more Sinhala-centric approach at home. How do you view this contrast in his activism? But back at home the compulsions were different. Here Dharmapala wanted to build pride among the Sinhala people about their historical achievements and legacies and make them feel ashamed of their current situation –to spur them to modernize. I don’t think he saw the two approaches (abroad and at home) as contradictory.They were part of a single mission. By building Sinhala and Buddhist pride at home he could give the Sinhala nation a place in the world order as a country that bequeathed the legacy of Buddhism to the modern world. But in pursuing this mission, how did Dharmapala respond to other ethnic and religious groups in Sri Lanka? How differently did people see each other back then? Can you give some examples? Regarding S. W. R. D. Bandaranaike, how do you think his Oxford memoirs from the 1920s influenced his nationalist consciousness and political aspirations? Why did Bandaranaike form the Sinhala Maha Sabha in 1936, and how did this influence his politics thereafter? What is also interesting is that Bandaranaike, even after he formed the Sri Lanka Freedom Party in 1951 after breaking away from the UNP, still supported parity of status for Sinhala and Tamil, and it was only very close to the 1956 election that he began to openly adopt a ‘Sinhala Only’ position. What this shows is that Bandaranaike’s affective relationship with some aspects of Sinhala nationalist thinking were at best guarded. However, he did publicly adopt Sinhala nationalism as his main political cause, because he saw that as the most effective political strategy to gain power. You write that 1956 marked the ‘institutionalization’ of Sinhala Buddhist nationalism. What do you mean by this? Moving on to Gunadasa Amarasekara, you say his writings took a nationalistic turn in the 1960s, due (in part) to public criticism by Martin Wickramasinghe. What other factors led to Amarasekara’s shift in ideology? Amarasekara’s ‘turn’ is an interesting one. It cannot be read simply as a political one. It was also to do with aesthetic belief and practice. In his early phase, Amarasekara had a distinct avant-garde edge to his writing.But in the 1960s he abandons this trajectory in his prose fiction and turns to a more realist narrative style. Thematically also he begins to project the ‘wewa, dagoba, yaya’ kind of discourse more explicitly in his writing. You can’t read this simply as a political move – it is more an aesthetic and cultural choice, though politics may have implicitly shaped it. It is later in the 1970s and 1980s that his writing takes a more distinctly political edge. You highlight two texts by Amarasekara, namely Abuddassa Yugayak(A topsy-turvy time) (1976) and AnagarikaDharmapala Maaksvaadeeda? (Is Anagarika Dharmapala Marxist?) (1980). What do these writings tell us about Amarasekara as a cultural critic? Both these texts are significant attempts at a kind of post-colonial cultural and literary criticism. The beginnings of some of the ideas that later influenced the influential Jathika Chintanaya movement are also found in these texts. Both the texts try to critically explore how a modern Sinhala nationalist intellectual project can be formulated, and in AbudassaYugayak in particular,Amarasekara discusses the role of literature in such a project. In the Dharmapala text,Amarasekara is building an argument for combining Buddhism and Marxism to formulate a modern political project. But later in his career he gives up this attempt at trying to infuse ‘western’ thinking with more ‘indigenous’ ideas,and begins to advocate a more nativist stance. The 1980s witnessed two tragic and violent events, the 1983 anti-Tamil pogrom and the 1987-89 JVP uprising. How did these events impact, or alter, the Sinhala nationalist discourse? Much of the Sinhala identity has its essence in the village. But the last few decades has seen a trend of rural disintegration. Is the village losing its significance in the Sinhala nationalist imagination? Sri Lanka just experienced a constitutional crisis, and is now grappling with constitutional reform and upcoming national elections. What aspects of Sinhala nationalism do you anticipate being played out in these scenarios? « “How Ethical Is It To Establish a National Govt by Enlisting the Support of a Single MP? – President Sirisena Raises Question Publicly in his Independence Day Address.